South East Asia is comprised of countries that lie geographically north of Australia, including south of East Asia, west of Oceania and the Pacific Ocean and east of South Asia and the Bay of Bengal. The region boasts all manner of attraction sites that are sure to appeal to the traveler in you. From the centuries-old temples to natural scenic beauty, there is simply no getting enough of the sights here. If you are planning a vacation any time soon, why not consider visiting South East Asia? The following is a list of the top 5 sights of South East Asia to help you plan the perfect vacation. If you have been to the Sunset Boulevard streets in LA and have marveled at the beauty of the setting sun, then you may be forgiven for thinking you have seen enough. The Temples at Bagan in Myanmar take this experience to a whole new level. 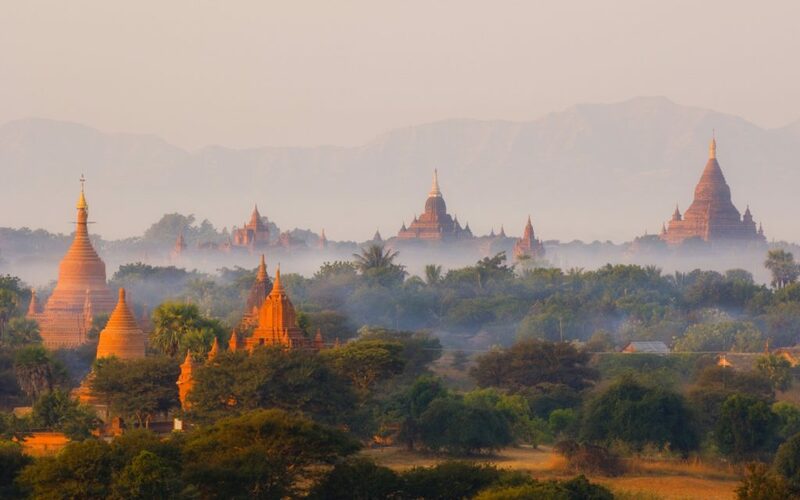 The high-rising temples situated on the Bagan plains are a sight to behold. Besides being great architectural marvels, the fact that there are so many of them in one place adds to their overall charm. If you are looking to escape into the spiritual realm, then a trip to South East Asia should certainly include a visit to these temples. Bali is one island in Indonesia that perfectly fits the description of Heaven on Earth. In administrative terms, it is merely a province in Indonesia, but in the world of travel and tourism, the island boasts natural attractions, a relaxed atmosphere and a perfect climate. Bali is also home to some of the world’s most enchanting beaches, ranging from black to sandy. There are plenty of water sports to keep you entertained at the beaches, as well as restaurants that serve both local and exotic dishes. Accommodation is offered at the island’s exquisite villas, most of which offer additional services such as spa treatment and massage therapy. Halong Bay is the perfect place to experience nature in the raw. Also known as “The Bay of Descending Dragons”, it presents a breathtaking karst topographical view (formed by the dissolution of soluble rocks such as dolomite, gypsum and limestone), that juts out of the sea to form more than 2000 limestone islets. Cruises among these formations are available, with occasional landings on the islets, giving visitors the opportunity to enjoy activities such as trekking and rock climbing. Visitors to Halong Bay should observe the seasons, because the Monsoons that occur from June to September and January to March, may impair visibility. Be that as it may, the bay still holds its charm, especially since it is one of the few least-crowded tourist sites in South-East Asia. The entire area of Luang Prabang is a listed UNESCO World Heritage site. Their greatest claims to fame are the numerous Colonial and Lao architectural structures scattered throughout the city. There are temples here that not only serve as spiritual places of worship, but also reveal more of the architectural heritage of the Laos people. Luang Prabang is also known for its alms procession and haute cuisine. Make sure during your stay, to not miss the daily morning rituals performed by monks clad in saffron-colored robes as they go around accepting food donations. The jungle that surrounds Luang Prabang teems with majestic waterfalls, crystal-clear bathing pools and lonely caves. Mount Kinabalu is Borneo’s highest mountain and the perfect place for mountain climbers and those who simply enjoy spending time out in the wild. The mountain is not only one of the most accessible in the world, but also offers climbers a smooth and straight ascent. It is predominantly snow-capped however, so climbers do need plenty of resilience to arrive at the top of the 4,095-metre peak, where they will be able to enjoy views stretching as far as the Philippines, provided that the fog is not too dense. Even on those days when the fog doesn’t allow for these extensive views, the fresh air, green vegetation and the calmness of the surrounding makes the climb up Mount Kinabalu exceptionally worthwhile.